I absolutely love this rug! I have been looking for the "perfect" rug for several months and was wary of ordering online. I finally decided to bite the bullet and I am so glad I did. It is great quality and it gives a classy look to our great room. The colors are true to the picture. I would highly recommend this rug! This was my first time ordering from Overstock and again was a little wary, but it was a great experience. It was delivered in a timely manner and the date was as advertised. An ancient pot-dying technique and dense, thick pile highlight this hand-spun traditional rug. Premium wool is used with a luster wash finish to give it a soft silky finish to ensure this is one of the most luxurious rugs. This area rug has an ivory background and a beige border and displays stunning panel colors of rust, yellow, tan and dark blue. Per the picture and description online, I expected this rug would feature a dark ivory to beige background with accents of red and dark blue. When the rug arrived and I unrolled it in my garage I thought I had made a huge mistake - the background of the rug appeared a very light green and the red appeared pink. Fortunately, on the floor in the house, the pink appears more red and the light green background is very muted against my furniture. 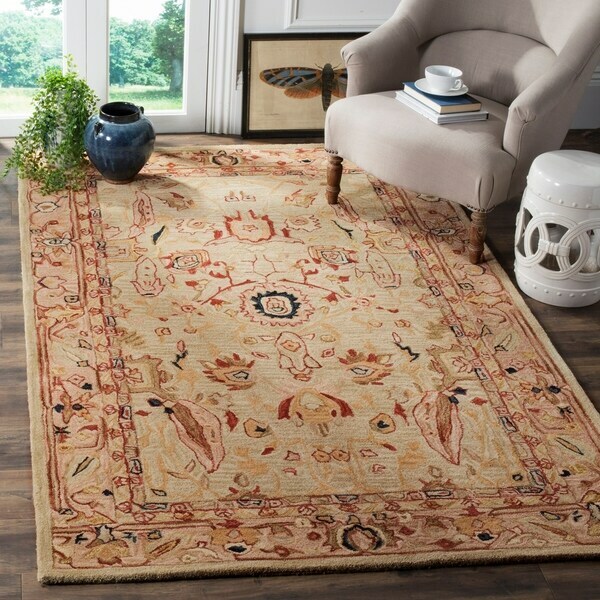 The pattern of the rug is absolutely gorgeous and just as pictured on the website. Be aware though that the background color of this rug is not ivory or beige, but more of a very light green. Looks great in my living room. Very comfortable to walk on and rich colors at unbeatable price! !